Less than 60 hours to liftoff! Chang’e-3 liftoff is set for around 18:00 GMT on 1 December, and the 15 m-diameter dish in Kourou will pick up the first signals around 18:44 GMT. its descent to the surface, expected around mid-day on 14 December. The landing and rover operations on the Moon will be commanded via two Chinese tracking stations at Kashi, in the far west of China, and at Jiamusi, in the northeast. Chinese New Report on this subject, way back from from 2006 This should clear the Pu-238 Issue. November 18 , National Defense Science and Technology and Quality Division in the hospital held a " one hundred milliwatts isotope plutonium-238 batteries developed " acceptance will , China's first plutonium-238 isotope batteries formally approved. The successful development of isotope batteries have long filled the gaps in the study of the field , marking China's research on the nuclear power system has taken an important step forward. Isotope batteries use radioisotopes decay process releases heat into electrical energy by a thermocouple , small size with light weight , reliable performance , long working life , environmental tolerance and good features , can a variety of special high-altitude environment , oceans , etc. in next job. With the further development of China's space exploration technologies and future deep space exploration needs, providing stability for our spacecraft , lasting energy has been on the agenda . So far , spacecraft instruments, equipment ideal isotope power source is a battery , the battery master a series of key technologies isotopes prepared and have independent research and production capacity is particularly important. In 2004, the isotope commitment to the " one hundred milliwatts isotope plutonium-238 battery research " task , in two years time , isotope and collaborative units to complete the overall design and a series of related technology research, developed the sample . Final testing showed that the detection of radiation protection battery indicators are in line with national security requirements, performance reached the technical requirements . Acceptance of the meeting, the project leader Luo Zhifu development process for the project , the key technologies, innovation and project management carried out a report , the group listened carefully to the report , after the scene to watch the battery prototype , review the information , it was agreed by project acceptance. The project marks the successful acceptance of China's first plutonium-238 isotope batteries developed a complete success , to fill the gaps in the field, laid the foundation for the development of certain technologies hair isotope power supply . Not much new, just reiteration that China is seriously thinking about exploiting the moon for its unique environment and resources, which the BBC correspondent labels as "startling vision"
"China will for the first time, use the X-band observation system in tracking and controlling Chang’e-3. This is unlike the previous mission, which used the S-band system." The X-band system was test flown on Chang'e-2 as a secondary unit. Apparently now its the primary. 4) The Chang’e-2 project developed and applied high sensitive digital transponder X-band technology based on a uniform carrier system; it also demonstrated the use of X-band deep space TT&C system and technology. This represents an advancement of China’s TT&C system from S-band to X-band system for higher transmission rates; it established the foundation for future deep space exploration missions. XICHANG, Nov. 30 (Xinhua) -- China will launch the Chang'e-3 lunar probe at 1:30 a.m. Monday in Xichang Satellite Launch Center, the mission's launching headquarters said here Saturday. 1:30am China Standard Time translates to 9:30 UCT 17:30UCT Sunday. The first picture was recently taken by some of YW-6’s crew who were expressing their blessings to CE-3. The second was taken 2 years ago during field test of the rover in Kumtag Desert. Signs were placed on a dead but long-standing trunk of a diversifolious poplar (胡杨, Hu Yang). The tree is also considered as a symbol of the spirits of those who devoted themselves to the founding of Dongfeng Space City (JSLC). Best wishes to CE-3 and all the teams. Any confirmed webcasts? Will CCTV cover liftoff? But it's on Monday (or Sunday for most of the regions). Yep! A picture is sometimes worth more than ten thousand words. It is really nice to know someone on Earth currently has the interest, political support, and funding to build a large Lunar Lander! Best of luck to Chang'e-3 and Yutu (Jade Rabbit), the Moon rover. @esaoperarions twitter feed will be one to watch for tracking updates, along with #ChangE3 hash tag. No live thread here yet less than 24h to launch ? The spacecraft is to be powered on in a hour from now. Upper stage cryogenic fuel loading will start at 10:10 UTC. CCTV plans to go live on the launch at 16:00 UTC (i.e. 1.5 hours before launch) - I guess this will be the same for its English channels. Temperature 4-6°C (dew point 2-4°C), low scattered clouds up to 30% coverage, humidity 60-80%, ground winds NW @ 1-3 m/s, maximum upper level winds 64 m/s from 280° direction at 11000m altitude. This morning all still go for launch - the fuelling of the rocket is completed, the weather is OK. Yes, the interface between ESOC and China's BACC – the Beijing Aerospace Command and Control Centre – is working. BACC is the headquarters of the tracking and control system for Chang'e 3. 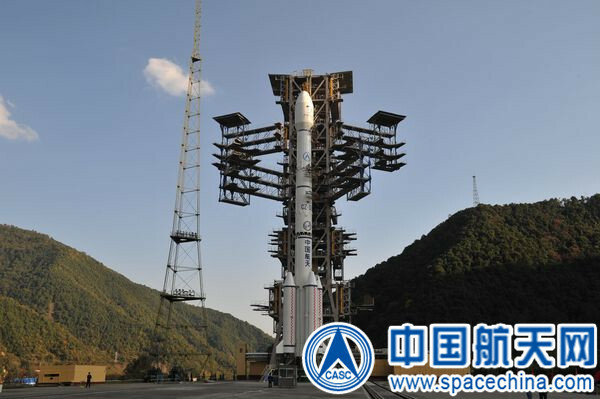 The Xinhua News Agency posted an update yesterday, giving a somewhat updated lift-off time of 18:30 CET.